This article is about aircraft. For the cocktail, see Aviation (cocktail). For other uses, see Aviation (disambiguation). The word aviation was coined by the French writer and former naval officer Gabriel La Landelle in 1863. He derived the term from the verb avier (an unsuccessful neologism for "to fly"), itself derived from the Latin word avis ("bird") and the suffix -ation. There are early legends of human flight such as the stories of Icarus in Greek myth and Jamshid and Shah Kay Kāvus in Persian myth. Later, somewhat more credible claims of short-distance human flights appear, such as the flying automaton of Archytas of Tarentum (428–347 BC), the winged flights of Abbas ibn Firnas (810–887), Eilmer of Malmesbury (11th century), and the hot-air Passarola of Bartholomeu Lourenço de Gusmão (1685–1724). The modern age of aviation began with the first untethered human lighter-than-air flight on November 21, 1783, of a hot air balloon designed by the Montgolfier brothers. The practicality of balloons was limited because they could only travel downwind. It was immediately recognized that a steerable, or dirigible, balloon was required. Jean-Pierre Blanchard flew the first human-powered dirigible in 1784 and crossed the English Channel in one in 1785. Rigid airships became the first aircraft to transport passengers and cargo over great distances. The best known aircraft of this type were manufactured by the German Zeppelin company. The most successful Zeppelin was the Graf Zeppelin. It flew over one million miles, including an around-the-world flight in August 1929. However, the dominance of the Zeppelins over the airplanes of that period, which had a range of only a few hundred miles, was diminishing as airplane design advanced. The "Golden Age" of the airships ended on May 6, 1937 when the Hindenburg caught fire, killing 36 people. The cause of the Hindenburg accident was initially blamed on the use of hydrogen instead of helium as the lift gas. 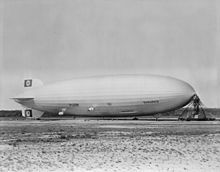 An internal investigation by the manufacturer revealed that the coating used in the material covering the frame was highly flammable and allowed static electricity to build up in the airship. Changes to the coating formulation reduced the risk of further Hindenburg type accidents. Although there have been periodic initiatives to revive their use, airships have seen only niche application since that time. There are many competing claims for the earliest powered, heavier-than-air flight. The first recorded powered flight was carried out by Clément Ader on October 9, 1890 in his bat-winged, fully self-propelled fixed-wing aircraft, the Ader Éole. It was reportedly the first manned, powered, heavier-than-air flight of a significant distance (50 m (160 ft)) but insignificant altitude from level ground. Seven years later, on 14 October 1897, Ader's Avion III was tested without success in front of two officials from the French War ministry. The report on the trials was not publicized until 1910, as they had been a military secret. In November 1906 Ader claimed to have made a successful flight on 14 October 1897, achieving an "uninterrupted flight" of around 300 metres (980 feet). Although widely believed at the time, these claims were later discredited. The Wright brothers made the first successful powered, controlled and sustained airplane flight on December 17, 1903, a feat made possible by their invention of three-axis control. Only a decade later, at the start of World War I, heavier-than-air powered aircraft had become practical for reconnaissance, artillery spotting, and even attacks against ground positions. Aircraft began to transport people and cargo as designs grew larger and more reliable. The Wright brothers took aloft the first passenger, Charles Furnas, one of their mechanics, on May 14, 1908. During the 1920s and 1930s great progress was made in the field of aviation, including the first transatlantic flight of Alcock and Brown in 1919, Charles Lindbergh's solo transatlantic flight in 1927, and Charles Kingsford Smith's transpacific flight the following year. One of the most successful designs of this period was the Douglas DC-3, which became the first airliner to be profitable carrying passengers exclusively, starting the modern era of passenger airline service. By the beginning of World War II, many towns and cities had built airports, and there were numerous qualified pilots available. The war brought many innovations to aviation, including the first jet aircraft and the first liquid-fueled rockets. After World War II, especially in North America, there was a boom in general aviation, both private and commercial, as thousands of pilots were released from military service and many inexpensive war-surplus transport and training aircraft became available. Manufacturers such as Cessna, Piper, and Beechcraft expanded production to provide light aircraft for the new middle-class market. By the 1950s, the development of civil jets grew, beginning with the de Havilland Comet, though the first widely used passenger jet was the Boeing 707, because it was much more economical than other aircraft at that time. At the same time, turboprop propulsion began to appear for smaller commuter planes, making it possible to serve small-volume routes in a much wider range of weather conditions. Since the 1960s composite material airframes and quieter, more efficient engines have become available, and Concorde provided supersonic passenger service for more than two decades, but the most important lasting innovations have taken place in instrumentation and control. The arrival of solid-state electronics, the Global Positioning System, satellite communications, and increasingly small and powerful computers and LED displays, have dramatically changed the cockpits of airliners and, increasingly, of smaller aircraft as well. Pilots can navigate much more accurately and view terrain, obstructions, and other nearby aircraft on a map or through synthetic vision, even at night or in low visibility. On June 21, 2004, SpaceShipOne became the first privately funded aircraft to make a spaceflight, opening the possibility of an aviation market capable of leaving the Earth's atmosphere. Meanwhile, flying prototypes of aircraft powered by alternative fuels, such as ethanol, electricity, and even solar energy, are becoming more common. Civil aviation includes all non-military flying, both general aviation and scheduled air transport. Boeing, Airbus, Ilyushin and Tupolev concentrate on wide-body and narrow-body jet airliners, while Bombardier, Embraer and Sukhoi concentrate on regional airliners. Large networks of specialized parts suppliers from around the world support these manufacturers, who sometimes provide only the initial design and final assembly in their own plants. The Chinese ACAC consortium will also soon enter the civil transport market with its Comac ARJ21 regional jet. Until the 1970s, most major airlines were flag carriers, sponsored by their governments and heavily protected from competition. Since then, open skies agreements have resulted in increased competition and choice for consumers, coupled with falling prices for airlines. The combination of high fuel prices, low fares, high salaries, and crises such as the September 11, 2001 attacks and the SARS epidemic have driven many older airlines to government-bailouts, bankruptcy or mergers. At the same time, low-cost carriers such as Ryanair, Southwest and WestJet have flourished. General aviation includes all non-scheduled civil flying, both private and commercial. General aviation may include business flights, air charter, private aviation, flight training, ballooning, parachuting, gliding, hang gliding, aerial photography, foot-launched powered hang gliders, air ambulance, crop dusting, charter flights, traffic reporting, police air patrols and forest fire fighting. Each country regulates aviation differently, but general aviation usually falls under different regulations depending on whether it is private or commercial and on the type of equipment involved. Many small aircraft manufacturers serve the general aviation market, with a focus on private aviation and flight training. The most important recent developments for small aircraft (which form the bulk of the GA fleet) have been the introduction of advanced avionics (including GPS) that were formerly found only in large airliners, and the introduction of composite materials to make small aircraft lighter and faster. Ultralight and homebuilt aircraft have also become increasingly popular for recreational use, since in most countries that allow private aviation, they are much less expensive and less heavily regulated than certified aircraft. Simple balloons were used as surveillance aircraft as early as the 18th century. Over the years, military aircraft have been built to meet ever increasing capability requirements. Manufacturers of military aircraft compete for contracts to supply their government's arsenal. Aircraft are selected based on factors like cost, performance, and the speed of production. 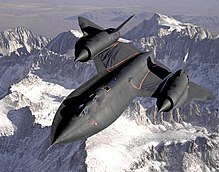 The Lockheed SR-71 remains unsurpassed in many areas of performance. Fighter aircraft's primary function is to destroy other aircraft. (e.g. Sopwith Camel, A6M Zero, F-15, MiG-29, Su-27, and F-22). Ground attack aircraft are used against tactical earth-bound targets. (e.g. Junkers Stuka, A-10, Il-2, J-22 Orao, AH-64 and Su-25). Bombers are generally used against more strategic targets, such as factories and oil fields. (e.g. Zeppelin, Tu-95, Mirage IV, and B-52). Transport aircraft are used to transport hardware and personnel. (e.g. C-17 Globemaster III, C-130 Hercules and Mil Mi-26). Surveillance and reconnaissance aircraft obtain information about enemy forces. (e.g. Rumpler Taube, Mosquito, U-2, OH-58 and MiG-25R). Unmanned aerial vehicles (UAVs) are used primarily as reconnaissance fixed-wing aircraft, though many also carry payloads. Cargo aircraft are in development. (e.g. RQ-7B Shadow, MQ-8 Fire Scout, and MQ-1C Gray Eagle). Missiles deliver warheads, normally explosives, but also things like leaflets. An aviation accident is defined by the Convention on International Civil Aviation Annex 13 as an occurrence associated with the operation of an aircraft which takes place between the time any person boards the aircraft with the intention of flight until such time as all such persons have disembarked, in which a person is fatally or seriously injured, the aircraft sustains damage or structural failure or the aircraft is missing or is completely inaccessible. The first fatal aviation accident occurred in a Wright Model A aircraft at Fort Myer, Virginia, USA, on September 17, 1908, resulting in injury to the pilot, Orville Wright, and death of the passenger, Signal Corps Lieutenant Thomas Selfridge. An aviation incident is defined as an occurrence, other than an accident, associated with the operation of an aircraft that affects or could affect the safety of operations. An accident in which the damage to the aircraft is such that it must be written off, or in which the plane is destroyed, is called a hull loss accident. Air traffic control (ATC) involves communication with aircraft to help maintain separation – that is, they ensure that aircraft are sufficiently far enough apart horizontally or vertically for no risk of collision. Controllers may co-ordinate position reports provided by pilots, or in high traffic areas (such as the United States) they may use radar to see aircraft positions. control towers (including tower, ground control, clearance delivery, and other services), which control aircraft within a small distance (typically 10–15 km horizontal, and 1,000 m vertical) of an airport. oceanic controllers, who control aircraft over international waters between continents, generally without radar service. terminal controllers, who control aircraft in a wider area (typically 50–80 km) around busy airports. ATC is especially important for aircraft flying under instrument flight rules (IFR), when they may be in weather conditions that do not allow the pilots to see other aircraft. However, in very high-traffic areas, especially near major airports, aircraft flying under visual flight rules (VFR) are also required to follow instructions from ATC. In addition to separation from other aircraft, ATC may provide weather advisories, terrain separation, navigation assistance, and other services to pilots, depending on their workload. ATC do not control all flights. The majority of VFR (Visual Flight Rules) flights in North America are not required to contact ATC (unless they are passing through a busy terminal area or using a major airport), and in many areas, such as northern Canada and low altitude in northern Scotland, Air traffic control services are not available even for IFR flights at lower altitudes. Water vapor contrails left by high-altitude jet airliners. These may contribute to cirrus cloud formation. Aircraft operating at high altitudes near the tropopause (mainly large jet airliners) emit aerosols and leave contrails, both of which can increase cirrus cloud formation – cloud cover may have increased by up to 0.2% since the birth of aviation. Aircraft operating at high altitudes near the tropopause can also release chemicals that interact with greenhouse gases at those altitudes, particularly nitrogen compounds, which interact with ozone, increasing ozone concentrations. Most light piston aircraft burn avgas, which contains tetraethyllead (TEL). Some lower-compression piston engines can operate on unleaded mogas, and turbine engines and diesel engines – neither of which require lead – are appearing on some newer light aircraft. Another environmental impact of aviation is noise pollution, mainly caused by aircraft taking off and landing. ^ "Aviation ou Navigation aerienne par G. de La Landelle". ^ Cassard 2008, p. 77. ^ Berliner 1996, p. 28. ^ De Angelis 1997, pp. 87–101. ^ "Aviation History". Archived from the original on 2009-04-13. Retrieved 2009-07-26. ^ "Sir George Carley (British Inventor and Scientist)". Britannica. Archived from the original on 2009-03-11. Retrieved 2009-07-26. English pioneer of aerial navigation and aeronautical engineering and designer of the first successful glider to carry a human being aloft. ^ "Clement Ader – French inventor". Archived from the original on 2012-03-08. ^ "FLYING MACHINES - Clement Ader". Archived from the original on 2012-02-04. ^ "EADS N.V. – Eole/Clément Ader". 20 October 2007. Archived from the original on 20 October 2007. ^ Gibbs-Smith, C. H., Aviation. London, NMSO 2003, p. 75. ^ Tom D. Crouch (August 29, 2008). "1908: The Year the Airplane Went Public". Air & Space/Smithsonian. Retrieved August 21, 2012. ^ "This Month in Exploration: May". NASA. Archived from the original on April 6, 2012. Retrieved August 21, 2012. ^ Kingsbury, Kathleen (October 11, 2007). "Eyes on the Skies". Time. Archived from the original on October 31, 2010. Retrieved April 26, 2010. ^ The Investigation Process Research Resource Site. "International Investigation Standards". Archived from the original on 27 April 2012. Retrieved 7 May 2012. ^ About.com Inventors. "Wright Brothers – First Fatal Airplane Crash in 1908". Retrieved 7 May 2012. ^ a b AirSafe.com. "Definitions of Key Terms Used by AirSafe.com". Archived from the original on 20 April 2012. Retrieved 7 May 2012. ^ "Aviation and the Global Atmosphere". Archived from the original on 2007-06-29. ^ Lin, X.; Trainer, M. & Liu, S.C. (1988). "On the nonlinearity of the tropospheric ozone production". Journal of Geophysical Research. 93 (D12): 15879–88. Bibcode:1988JGR....9315879L. doi:10.1029/JD093iD12p15879. ^ Grewe, V.; D. Brunner; M. Dameris; J. L. Grenfell; R. Hein; D. Shindell; J. Staehelin (July 2001). "Origin and variability of upper tropospheric nitrogen oxides and ozone at northern mid-latitudes". Atmospheric Environment. 35 (20): 3421–33. Bibcode:2001AtmEn..35.3421G. doi:10.1016/S1352-2310(01)00134-0. Retrieved 2007-11-20. Berliner, Don (1996). Aviation: Reaching for the Sky. The Oliver Press, Inc. ISBN 1-881508-33-1. Cassard, Jean-Christophe (2008). Dictionnaire d’histoire de Bretagne (in French). Morlaix: Skol Vreizh. ISBN 978-2-915623-45-1. De Angelis, Gina (2001). The Hindenburg. Philadelphia: Chelsea House Publishers. ISBN 0-7910-5272-9.